Quick and easy but delicious, these cookie bars are fantastic. 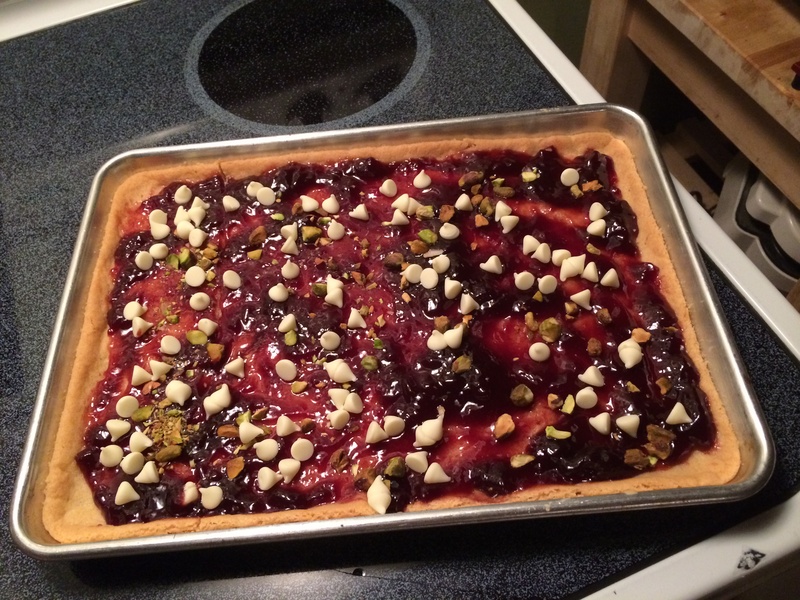 All You need is a half sheet pan, some parchment paper, sugar cookie dough, raspberry jam and you favorite toppings. I used pistachios and white chocolate, but you could use anything you like, and any jam you like, the possibilities are endless. Just spread the cookie dough out evenly on the parchment paper so you cover the entire sheet pan and follow the directions for cooking the sugar cookies. After the cookie has cooled completely then spread the jam over the top and add you toppings. Place in the frig for around half and hour so the jam sets nicely and cut into squares. Yum!